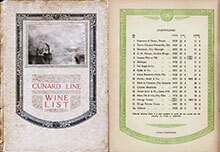 On May 27, British luxury liner Queen Mary leaves Southampton en route to New York on her maiden voyage and then becomes the flagship of the Cunard-White Star Line. Among the 14,500 bottles of wines and Champagne proposed aboard, Champagne BINET Elite cuvees prominently appears on the wine list. The commercial partnership with the Cunard Line provides Maison BINET with a very prestigious and international showcase. At the same time… First publication of “Gone with the Wind”, the novel written by Margaret Mitchell rewarded by the Pulitzer Prize in 1937 and adapted into an American film in 1939 (June 10).